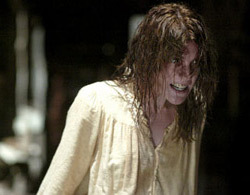 Part spine-tingling horror movie, part unorthodox courtroom drama, "The Exorcism of Emily Rose" maintains a surprisingly deft balance between the two parts of its plot, but still runs into trouble because it's ironically more credible as the former than the latter. Inspired by the real trial of a priest (Tom Wilkinson) charged with negligent homicide for an exorcism gone wrong, co-writer and director Scott Derrickson provides the film with flashbacks to the alleged possession of a naive Catholic college student (newcomer Jennifer Carpenter) that are far more down-to-earth than any effects-driven exorcism chiller -- and therefore more disturbing as well. Carpenter's ability to contort her face and body into seemingly broken forms is spooky enough all on its own, but add her over-dilated eyes, her bug-eating, her self-mutilation, her demonic speaking-in-tongues and the decaying faces with scooped-out eyes she sees all around her, and Emily Rose makes "The Exorcist's" Regan MacNeil look like a carnival ride. The courtroom scenes that frame these episodes start strongly as well, with the gifted Laura Linney ("Kinsey," "Mystic River") playing the priest's skeptical defense attorney. A rising hot-shot who recently got a serial killer off the hook (but not without consequences), she takes this case in order to make partner at her firm. The fact that she begins experiencing the same midnight hauntings that started Emily's downward spiral seems to be a bit of artistic license, but it certainly adds tension to the film. Unfortunately, her trail strategy is clearly driven by narrative concerns and not jurisprudence -- and as a result she comes off looking like she got her law degree from a box of Cracker Jack. When Emily's devout, struggling farm family is on the stand, Linney asks them about anything but the night of the failed exorcism itself. When she digs up a doctor who studies possessions from a scientific point of view, the rather mystic Indian woman (Shohreh Aghdashloo, "House of Sand & Fog") looks like a quack to the folksy Midwestern jury. Doesn't Linney interview and coach her witnesses before putting them on the stand? And when the priest testifies -- he has refused a plea bargain specifically because "what I care about is telling Emily Rose's story" -- she only lets him recount half his tale before cross-examination (Campbell Scott is the religious but relentless prosecutor), then recalls him later in the trial for the rest, because otherwise the film wouldn't have a third act. "The Exorcism of Emily Rose" has its fair share of keen surprises of both legal and supernatural origins, and Derrickson does a fine job of walking a line between faithful and skeptical views of the film's events. The twisting of the same medical evidence to fit both prosecution and defense strategies is particularly cunning. But sometimes he flat-out cheats the audience. He'll show a witness's direct questioning, but not show the cross-examination. He'll imply the importance of a locket, yet not one character ever thinks to ask what's inside. The film maintains a certain power through its uniformly impeccable performances and its substantial ambiance, which captures both the austerity of its farm-county setting (the courtroom is a bland brick building, not an ostentatious Hollywood set) and the dark, shadowy terrors of Emily's trauma, played out in flashback (often featuring shaky-cam overkill) through the priest's vivid testimony. Derrickson clearly fancies his film a large intellectual step up from the horror genre, but the structural concessions in his courtroom plot -- made to accommodate those flashbacks in a way that builds maximum apprehension -- are so blatant they become more of a hindrance than a help in telling the story. "The Exorcism of Emily Rose" does garner goosebumps and does engage you on a cerebral level as well, but the big picture just is not the sum of its parts.